So for those of you out there on pins and needles, yes we passed the review on Friday. The lady looking over our portfolios was pleasant and interested and apparently had no hangups about reading comprehension worksheets. Of course, it also helped that I didn’t have the kids with me this time, so I could form coherent sentences and not have all my papers thrown on the floor. In fact, I think I was so excited to be able to talk to another adult without being interrupted that I simply babbled for half an hour (we were scheduled for 1.5 hours!) until there was no room left on her review sheet to write anything. But still, it’s nice to review what The Girl did with you, dear internet, for her very first Official Homeschooling Semester. For English, she used All About Spelling Book 1, did some MadLibs, spent a lot of time at Starfall.com, and enjoyed many, many MadLibs with us. 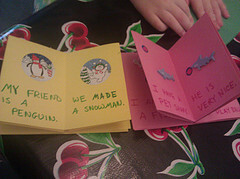 I made little books for her to read, and she wrote out little books of her own.Oh, and MadLibs. In Math, she used a combination of Math-U-See Alpha and Singapore 1a. She prefers doing math pages I draw for her, making sure to include a lot of cute pictures. She does simple addition and subtraction, puts sequences in order, determines which is greater (or lesser), and other fun little things. We also follow the Living Math curriculum along with history, and we did fun little activities related to that, such as carving tally marks on our own little replica Ishango bones. 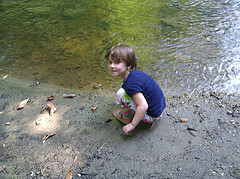 Her science lessons come from the K-2 version of her brothers book, Building Foundations of Scientific Understanding. She had lessons about matter, life cycles, globes, maps, and of course also sat in on her brothers lessons. 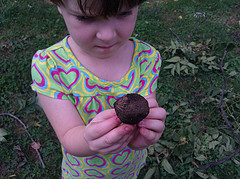 Here she is observing a walnut on a nature walk so we can identify it. In history, she uses SOTW (just like her brother — can you sense a theme here?) and is learning about the Ancients. She is less enthusiastic about all the wars than he was. We spent a lot of our time on prehistory, too. She was really interested in the section about human evolution in Prehistoric Life: The Definitive Visual History of Life on Earth. A main part of PE was gymnastics. She’s very bouncy and stretchy and full of balance. We spin and run and throw and kick. 🙂 On Halloween the gym had a free hour playing on the equipment, in costume. Health is mainly just about eating healthy, getting sleep, staying clean and all of those other good things. We talk about how to behave nicely to people and how to be safe playing with the baby. 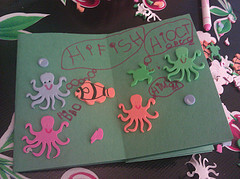 She has a younger kid version of the Kidpower coloring books that we use, too. Art and music are incredibly free-form. She sings along with her brother’s songs and learns the various art techniques. 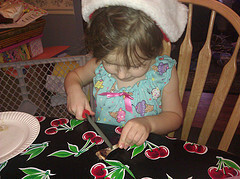 She makes up her own songs and draws and colors and paints whenever she can. As the reviewer pointed out, art is embedded in just about everything else we do! In our next installment, an outline of a plan for Spring 2012!